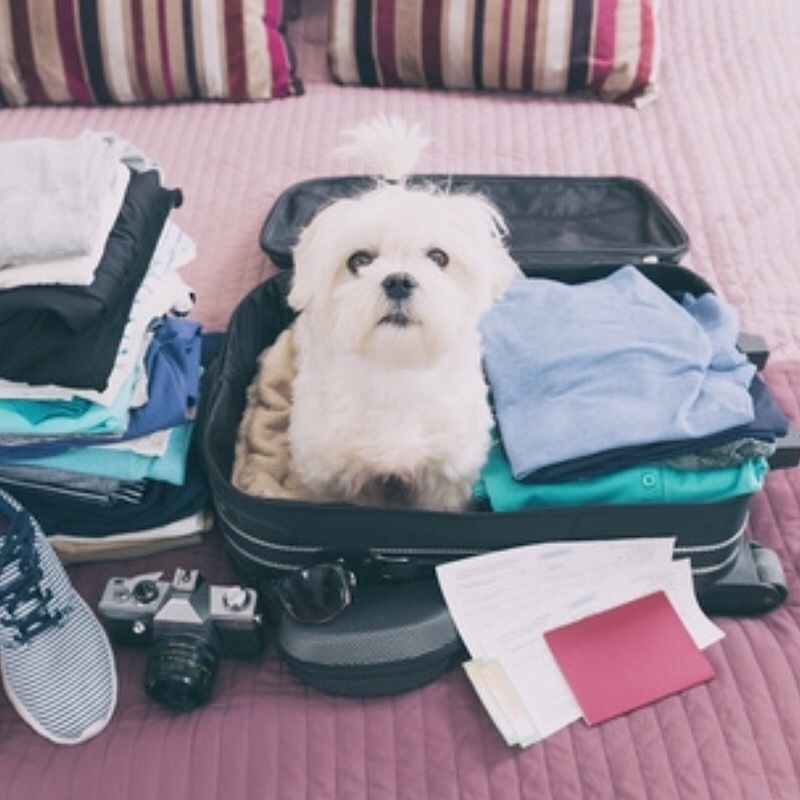 5 PUPSIZE DOG ITEMS TO ADD TO YOUR SUITCASE. In addition to your packing list, here are 5 items to put in your suitcase, that you may not have thought of. Things happen when you’re away from home and papers can be misplaced or tossed by mistake- including your dog’s Health Certificate and/or Medical Records. Making an extra copy of your PupSize Dog’s Health Certificate and Medical Records may save you the trouble of having to obtain a copy when you’re on vacation. Most Airlines require you to present a valid Health Certificate at check in and even though they you presented it to them to get to your destination, Airlines do not store a copy in their system. In today’s world, it is also a good idea to snap a photo of the documents with your phone and keep a digital copy with you. 2. A Recent Photo of your Pup. Yes, things can happen, and hopefully you will never need a recent photo of your pup – if they go missing during your trip, it can happen. Having a recent, printed photo of your pup will help save precious time, if you ever need to post flyers. It is better to safe and be prepared for the worst, then to have to scramble when something horrible is happening. Packing a travel size bottle of your pup’s shampoo along with their comb and/or brush, is also a good idea. I also pack some of her baby washcloths to keep her adorable little face kissable. Even if you will only be gone for a few days, being away from home, means being out and about and getting dirty, especially with all those new smells. Our hair shampoo and those provided in hotel rooms are too harsh for our delicate fur babies and when we are away from home, it’s usually not the best thing to change anything, including their shampoo. Food and water dishes may be common sense, but many times in the frenzy of preparing for a trip, we forget. I like to pack Abigail’s bowls in a zip lock bag, along with some paper towels, because even the finest and most pet friendly hotels, don’t have paper towels in their guest rooms. Every PupSize dog has their favorite toy, or if they are like Abigail, every toy you show them is their favorite toy. I find the toys with squeakers are her favorite and typically before I zip up the suitcase, she has somehow managed to find it, take it out and is playing with it. What I usually do is pack her toys in one of those dust bags that comes with a handbag, these bags seem to work the best, because they are lightweight and have a drawstring, (and can also be used as a laundry bag- to make unpacking easier when you get home). If your pup like to play fetch, I suggest packing a ball. Hotel hallways are a great place to play fetch- if you don’t get caught- PupSize dogs can usually get away with this because they get tired so easily and most of the staff members at your favorite pet friendly hotel can’t resist our adorable, playful pups. Also, I was once told…It’s better to ask for forgiveness, then permission. Playing fetch indoors is also a great idea before catching your flight home, especially if you are visiting a cold climate, where your pup can’t get a good walk in before heading to the airport.